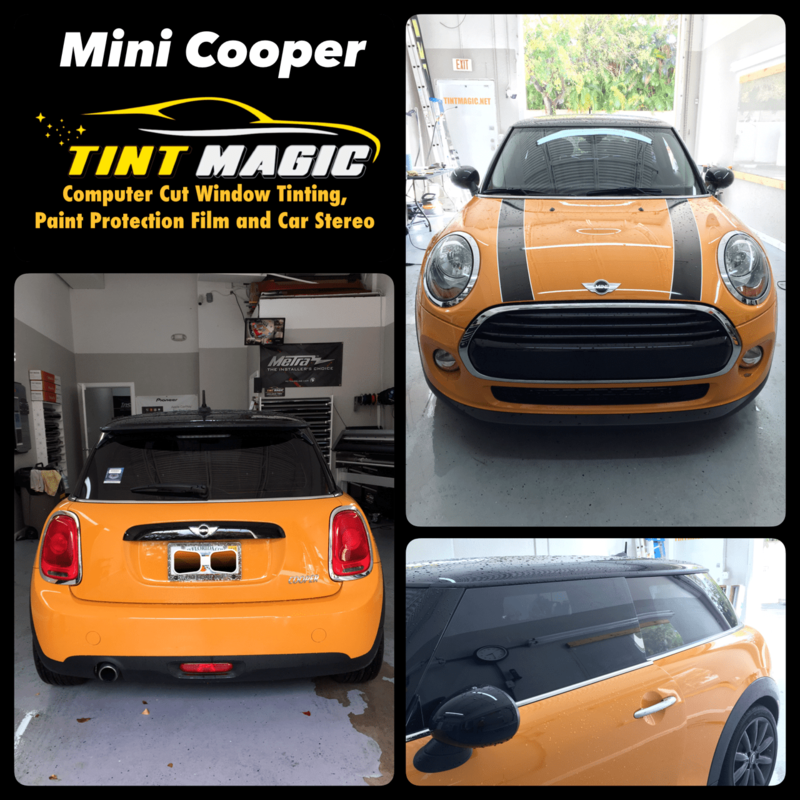 Mini Cooper at Tint Magic Window Tinting Coral Springs. We have applied SunTek CXP Nano Carbon 25% all over around. Call us for a free estimate! (954)840-7883. We are located at 11344 Wiles Road Coral Springs, Fl 33076. Under BMW’s stewardship, the Mini Cooper has been a rambunctious ball of hanky-panky, all stiff ride, manic responses, and general churlishness. Alas, the blouses are being rebuttoned and the flies re-zipped, for—like a parent interrupting a teen groping session—BMW is tossing some cold water on its spry British hatchback. It starts with forcing the Mini onto BMW’s new, larger front-drive platform. BMW’s compact UKL structure won’t go any smaller, meaning the base Cooper tested here, relative to its predecessor, is saddled with a 209-pound ball and chain plus a larger footprint. As it does in the 189-hp Cooper S, the enlargement dulls the car’s responses and calms the ride. That the S model shrugs off the chub when accelerating is expected; that this less-powerful Cooper does the same is not. Up 16 horsepower and 48 pound-feet of torque on the old Cooper’s 1.6-liter four—for totals of 134 ponies at 6000 rpm and 162 pound-feet at 1250—the triple doesn’t much notice the Cooper’s recent Bavarian spaetzle binge. We hit 60 mph in 7.3 seconds, 0.4 second quicker than in the outgoing model and nearly as expediently as the first-gen supercharged Cooper S.
The engine’s slender power band sits low in the rev range and is yoked to gearing taller than a skyscraper (at 100 mph in sixth, the tach reads just over 3000 rpm). So, the motor is markedly calm on the highway. Diligent shifting is required for maximum haste. Yet even when fully wound out, the three-pot remains baby-bottom smooth and emits only a pleasing gurgling sound and subtle turbo whistle. We recorded an average of 32 mpg—2 more than the old Cooper.